Some spent Halloween handing out candy, but I spent the night enjoying all the treats being offered at the 6th annual Food & Wine Classic at the Walt Disney World Swan & Dolphin. My evening started with one of the seminars, Modern Mixology, where instructor Lindsay Skillman walked us through some of the new tools being used to create cocktails. We learned how to make gelatin balls filled with alcohol, how to infuse alcohols, and even how to use liquid nitrogen. We also got to taste several of the finished cocktails, including an Oreo-infused vodka shot, and the Swedish Fish cocktail from the hotel’s bluezoo restaurant. After the seminar, we headed outside to partake in food samples. Sample booths lined the causeway between the two hotels, as well as the walkways around the Swan. The booths offered a variety of food samples from the restaurants at the Swan and Dolphin, as well as the hotels’ food and beverage departments. 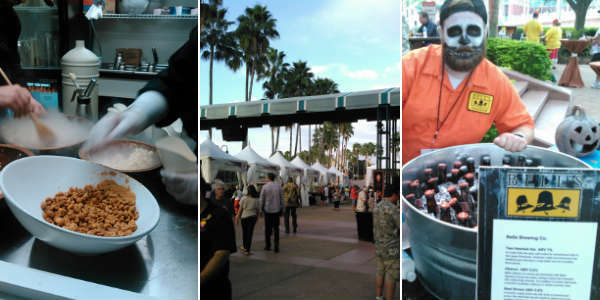 We grabbed a sip of the new Ty Ku Coconut Sake, which was so light and refreshing, and then headed into the event’s beer garden. We enjoyed a fresh made pretzel, some schnitzel, along with glasses of a Shipyard Pumpkin Ale and a Saint Arnold Santo. There were so much good food, but my guest and I had our favorites. I enjoyed the Picabu pork taco with toppings bar and the Mascarpone and Chestnut Ravioli with Italian Sausage from Il Mulino. She enjoyed the carved Prime NY Strip on a bed of garlic mashed potatoes from Shula’s Steakhouse, and the Garden Grove Fish n’ Chips. We both enjoyed the Cabot Cheese Mac ‘n’ Cheese with toppings bar (I added tomotoes, bacon, and green onions). And let’s not even go into how awesome the funnel cake topped in Nutella was. In fact, I enjoyed most of the food in this whimsical Carnival Corner, which was new to the event. There were plenty of wines to sample, but the standout to me was the Mionetto Prosecco. Other adult beverages I also enjoyed were the Leinenkugel Cranberry Ginger Shandy and the Florida Mule made with St. Augustine Distillery vodka. As the event wound down, I was able to get one more treat — a Coffee Caramel Pecan Eclair. It was so full of flavor and yet light and airy. A perfect way to cap the night’s culinary delights. If you’re a foodie, and you’ve never experienced the Swan and Dolphin Food & Wine Classic, you’re definitely missing out on a top notch gastronomic event that will leave your taste buds and tummy very happy. It will return next fall, and we’ll let you know as soon as we know dates for 2016. Disclaimer: We were guests of the Walt Disney World Swan & Dolphin. As always, our opinions are honest, and our own.